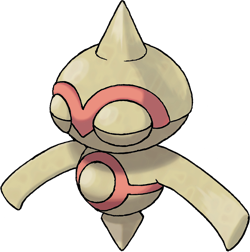 X It moves while spinning around on its single foot. Some Baltoy have been seen spinning on their heads. X Es bewegt sich, indem es auf seinem Fuß kreiselt. Vereinzelt sieht man Puppance, die kopfüber kreiseln. X Il se déplace en tournoyant sur son pied. Même mis sur la tête, il peut continuer à tourner. X Se mueve girando sobre su eje. También se le puede ver girando cabeza abajo. X Si sposta piroettando sull’unica estremità inferiore del proprio corpo. Molti fanno la verticale. X 한 다리로 회전하면서 이동한다. 거꾸로 회전하는 오뚝군도 발견된다. Y It moves by spinning on its foot. It is a rare Pokémon that was discovered in ancient ruins. Y Es bewegt sich, indem es sich auf seinem Fuß dreht. Ein seltenes Pokémon, das in alten Ruinen lebte. Y Il se déplace en tournoyant sur son pied. Ce Pokémon rare fut découvert dans de vieilles ruines. Y Se mueve girando sobre su eje. Es un extraño Pokémon que fue encontrado en unas viejas ruinas. Y Pokémon raro che si muove roteando su se stesso. È stato scoperto nei pressi di antiche rovine. Y 한 다리로 회전하면서 이동한다. 고대 유적에서 발견된 희귀한 포켓몬이다. Omega Ruby As soon as it spots others of its kind, Baltoy congregates with them and then begins crying noisily in unison. This Pokémon sleeps while cleverly balancing itself on its one foot. Omega Ruby Sobald es Artgenossen bemerkt, tut sich Puppance mit ihnen zusammen und sie brüllen gemeinsam. Dieses Pokémon schläft, während es geschickt auf seinem Fuß balanciert. Omega Ruby Dès qu’il repère ses congénères, Balbuto les rejoint et ils se mettent tous à crier en chœur. Ce Pokémon arrive à dormir en restant adroitement en équilibre. Omega Ruby Al ver a más de los suyos, Baltoy se une al grupo y todos se ponen a chillar escandalosamente y al unísono. 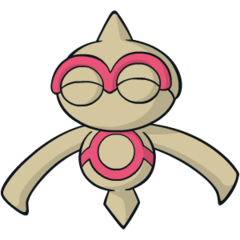 Este Pokémon duerme manteniendo hábilmente el equilibrio sobre la extremidad inferior que tiene. Omega Ruby Appena incontra i propri simili, Baltoy forma un gruppo molto rumoroso. Questo Pokémon dorme bilanciandosi con maestria sull’unica estremità inferiore del proprio corpo. Omega Ruby 동료를 발견하면 바로 모여들어 일제히 울음소리를 내기 때문에 시끄럽다. 외다리로 능숙하게 선 채로 잔다. Alpha Sapphire Baltoy moves while spinning around on its one foot. Primitive wall paintings depicting this Pokémon living among people were discovered in some ancient ruins. Alpha Sapphire Puppance bewegt sich, indem es sich auf seinem Fuß im Kreis dreht. In sehr alten Ruinen wurden primitive Wandmalereien entdeckt, die dieses Pokémon in Begleitung von Menschen zeigen. Alpha Sapphire Balbuto se déplace en pivotant sur son unique pied. Des peintures rupestres montrant ce Pokémon vivant avec les hommes furent découvertes dans des ruines très anciennes. Alpha Sapphire Baltoy se mueve girando alrededor de sí mismo sobre la extremidad inferior que tiene. En unas ruinas antiguas, descubrieron pinturas rupestres en las que aparecía este Pokémon conviviendo con personas. Alpha Sapphire Baltoy si muove piroettando sull’unica estremità inferiore del proprio corpo. La scoperta di alcune rovine antiche ha portato alla luce dipinti di questo Pokémon che viveva a stretto contatto con gli esseri umani. Alpha Sapphire 외다리로 회전하며 이동한다. 오뚝군과 인간이 함께 사는 고대 벽화가 유적에서 발견됐다. Ruby Baltoy moves while spinning on its one foot. Primitive wall paintings depict this Pokemon living among people were discovered in ancient ruins. Sapphire As soon as it spots others of its kind, BALTOY congregates with them and then begins crying noisily in unison. This POKeMON sleeps while cleverly balancing itself on its one foot. FireRed It was discovered in ancient ruins. While moving, it constantly spins. It stands on one foot even when asleep. LeafGreen It was discovered in ancient ruins. While moving, it constantly spins. It stands on one foot even when asleep. Emerald A BALTOY moves by spinning on its single foot. It has been depicted in murals adorning the walls of a once-bustling city in an ancient age. Diamond It moves by spinning on its foot. It is a rare Pokémon that was discovered in ancient ruins. Pearl It moves by spinning on its foot. It is a rare Pokémon that was discovered in ancient ruins. Platinum It moves by spinning on its foot. It is a rare Pokemon that was discovered in ancient ruins. HeartGold It moves while spinning around on its single foot. Some BALTOY have been seen spinning on their heads. SoulSilver It moves while spinning around on its single foot. Some BALTOY have been seen spinning on their heads. Black It moves by spinning on its foot. It is a rare Pokémon that was discovered in ancient ruins. White It moves by spinning on its foot. It is a rare Pokémon that was discovered in ancient ruins. Black 2 Discovered in ancient ruins, it moves by spinning around and forms a group when it finds others. White 2 Discovered in ancient ruins, it moves by spinning around and forms a group when it finds others.